One of the major challenges in studying timing is that time is inevitably associated with changes in other variables, such as movement, or sensation. Therefore, the behaviours tested in the Learning lab are carefully chosen to help separate neural activity which is related to time from other ongoing variables. The team studies these behaviours in rats and mice while simultaneously recording the activity of multiple neurons and manipulating their activity. This way, the team can observe how information about time can be encoded across networks of neurons. 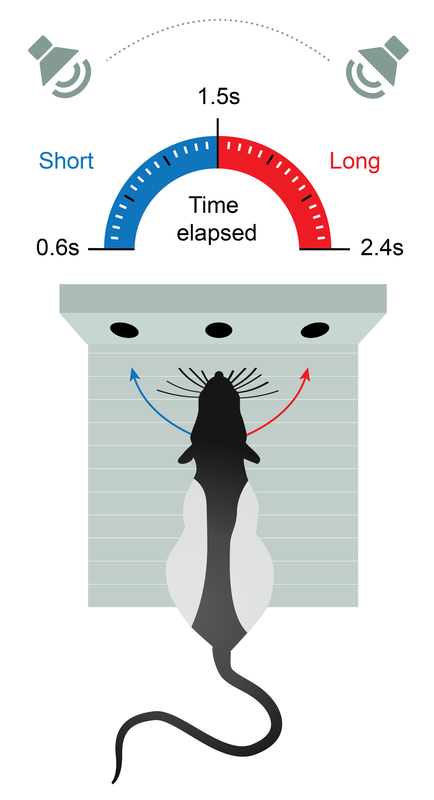 Indeed, one of the lab’s largest contributions thus far has been to discover that information about elapsed time can be encoded in a kind of wave of activity that travels slowly across populations of neurons in the basal ganglia. In addition to the basal ganglia, an area known to be important for timing, the team also studies the thalamus and frontal areas of the cortex. These frontal areas specifically are optimal sites for studying timing behaviour as they are thought to be involved in the association of experienced positive outcomes with the choices and actions that have led to them, or in other words, creating a mental connection between causes and positive effects. A deeper understanding of these areas could have far reaching implications for grasping how people function in both healthy and pathological conditions such as addiction or Parkinson’s disease. The striatum forms a major input structure for the basal ganglia, and is a site of degeneration in diseases such as Parkinson’s and Huntington’s disease. It receives input broadly from cortex and thalamus, as well as from neuromodulatory systems, and funnels the resulting activity into a successively decreasing number of neurons before transmitting its output to the thalamus. This architecture is thought the facilitate selection of representations of actions, events, thoughts and relationships between them, from its various input patterns. Interestingly, perturbing normal function there through lesions or pharmacology can cause deficits in timing behavior, and, depending on site and type of manipulation, different aspects of learning. By parametrically varying a time interval that a rat estimates, while simultaneously recording action potentials from single neurons in the striatum, we aim to identify neurons whose activity is correlated with a change in estimated interval. The signals we identify will provide a starting point for modeling efforts as well as perturbation studies, wherein specific neural signals can be manipulated. We have begun by recording from neurons in the striatum of the rat. We will test the hypothesis that some of these neurons will shift their response rate and/or latency as we shift the time interval that rats estimate. By identifying neurons with such “tuning” for a temporal interval, we hope to identify a neural substrate for the time-based computations that may underlie learning.